trying hard not to drool on the page? Too many to count. I dreamed of knitting this sweater, thought about what yarn I would use, what techniques for its construction, how the cables would feel, how beautiful the finished sweater would be. 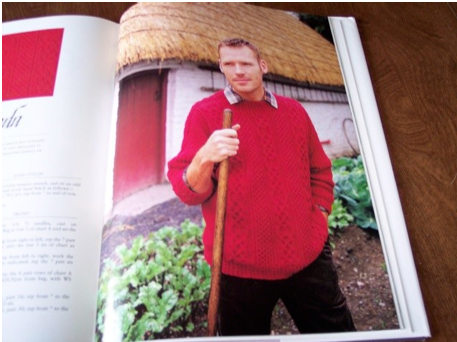 But never once did I think that St. Enda would be a pretty quick knit. When I cast on for this sweater back on October 6th, I was hoping that I would be able to finish it in time to give it to my son for the Winter Solstice holiday, but I wasn’t optimistic that my time frame was realistic. 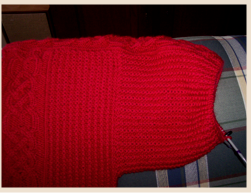 In fact, I thought I was a first class fool to think that I could complete this sweater in only two-and-a-half months. St. Enda has grown quite rapidly. and, although sleeves seem to always take longer than you expect, I’m confident that, barring any unforeseen calamity, I’ll have both sleeves done by the time December arrives on my doorstep. Anyway, the knitting has gone very smoothly. The central cable looks complicated, and it does have a rather unusual increase that takes two rows to complete, but the directions are clear and the increase is simpler to do than it sounds. Naturally, I’m not knitting the pattern as written. 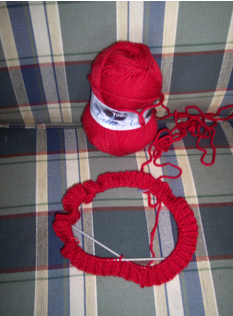 I toyed around with knitting it FLAK-style, all in one piece from the top down, starting with the saddles, but I was too intellectually lazy to do the math.☺ Instead, I started at the bottom, but I’m knitting in the round instead of flat so that I don’t have to seam pieces together. I hate seaming. I also changed the bottom rib. 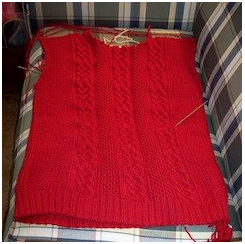 Instead of doing the lovely cabled rib, I did a 2 x 2 rib instead. 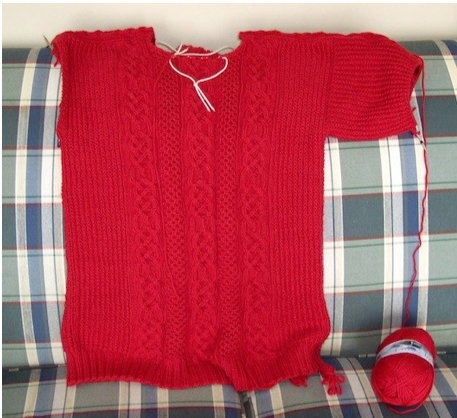 I’ll do the same ribbing on the cuffs and the neckband when the time comes. The boy doesn’t like his sweaters to be too frou-frou. I was going to attach the saddles (aka shoulder straps) to the live shoulder stitches as I knitted the saddles, but I was afraid the stitches wouldn’t be firm enough to hold the weight of the sweater without sagging or stretching out, so I ended up casting off the shoulder stitches and seaming them to the saddle. This gives me a nice firm edge that will hold the weight of the sweater with no problem. 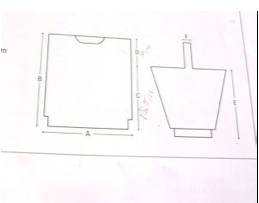 The shoulder seams are the only seams in the entire sweater. 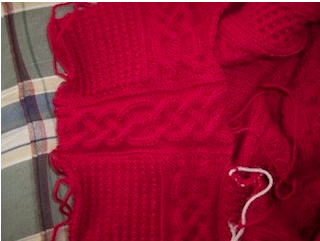 Did I ever mention I hate seaming? This is the point at which I must once again state unequivocally that I would never have had the confidence to change the method of construction had I not participated in Janet Szabo’s Follow-the-Leader Aran Knit-Along (FLAK). Janet rules!